It’s a magical place. A place where dreams come true. Children around the world look forward to visiting the site’s most famous resident, sitting on his lap, and telling him the gifts they want for Christmas. 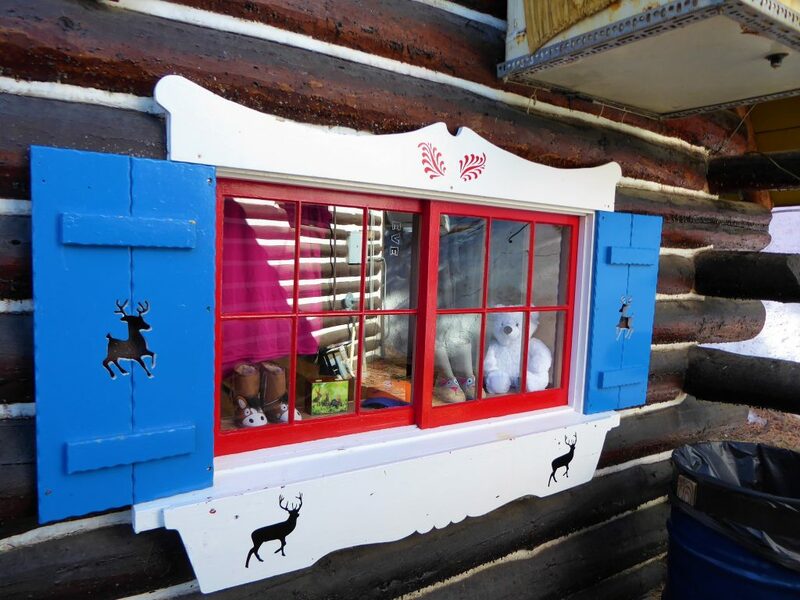 Santa’s Workshop at the North Pole in Colorado is the place where wishes come true. Christmas is magical in our house. Yearly, we look forward to a midnight visit from Santa Claus and his reindeer. We were excited to visit the Big Man in person at Santa’s Workshop, at the base of Pikes Peak. 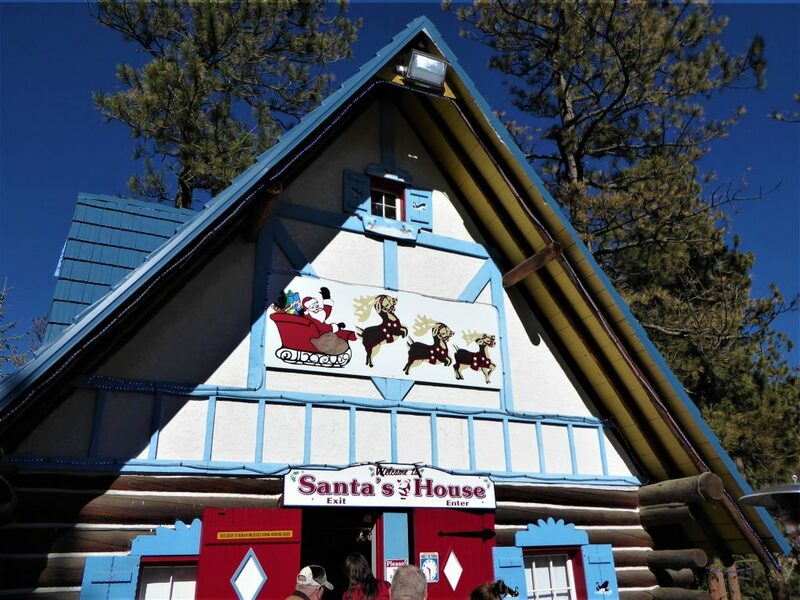 While there, we were able to see and talk to Santa, catch a magic show, ride some wild rides, and enjoy the wonder of a Nordic-inspired village. We have done the hard work for you, so you can enjoy everything at the park. 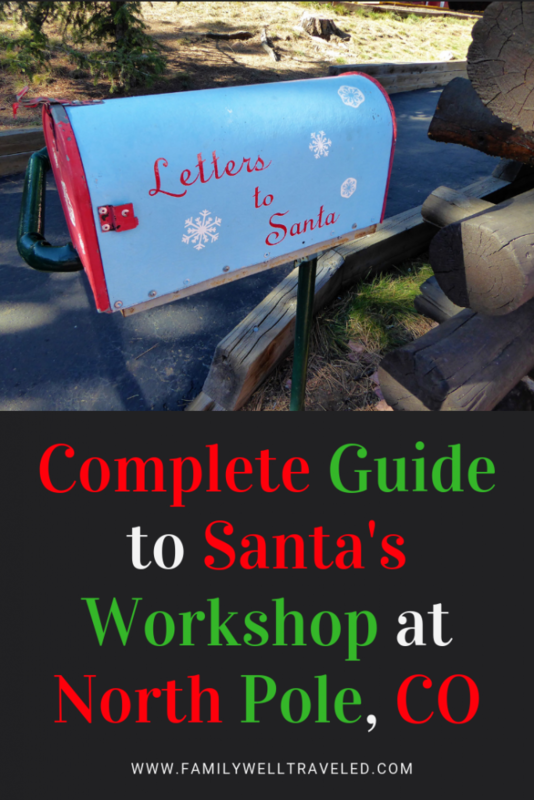 Here is our complete guide to Santa’s Workshop at the North Pole. Santa’s Workshop North Pole opened in 1956. The park is tucked away at the base of Pikes Peak, a short drive from Colorado Springs. Much of the park has steep inclines (and declines) as you are walking up and down the mountainside. It’s important to always watch your step because of the sloping sidewalks and steps throughout the park. The park to this day has a 1950s feel to it. The Christmas Village looks like something from a different era, which helps add to the magic of the place. Most of the rides and shows have been in the park since its opening. However, the park still has a charming appeal despite the age of some of the attractions. Admission to the park is $24 per person, which covers all the rides and shows and a visit to Santa. Of course, food, Santa pictures, and merchandise cost extra. You can print or download discount coupons from the website which saves you a few bucks off the admission fee. Adults 60-years and older get into the North Pole for free, so it’s a perfect spot to bring the grandparents to share in the holiday fun. The park is open throughout the year, but the busiest times are from Thanksgiving to Christmas Eve. Hours are 10 a.m. to 5 p.m. most days. Check the North Pole website for days and hours. There are a couple of shows that you can watch while at Santa’s Workshop at the North Pole. The magic show takes place several times a day. Your wizard guide delights the audience with a 15-minute show, which includes classic magic acts. Adults will have seen all the tricks before, but the young ones enjoy the show, especially when a rabbit appears at the end of the show. Elmer the Elf is an animatronic show featuring an elf who sings while strumming a guitar. Elmer appears in the Christmas Village. He went largely unnoticed during our visit, but I did stop to get some video of his show. Finally, the glass blower demonstrates his skill in his glass-blowing shop. Shows are announced throughout the park 10-minutes before showtime. All of the rides at the North Pole are suitable for families. Although there are height requirements for a handful of rides. 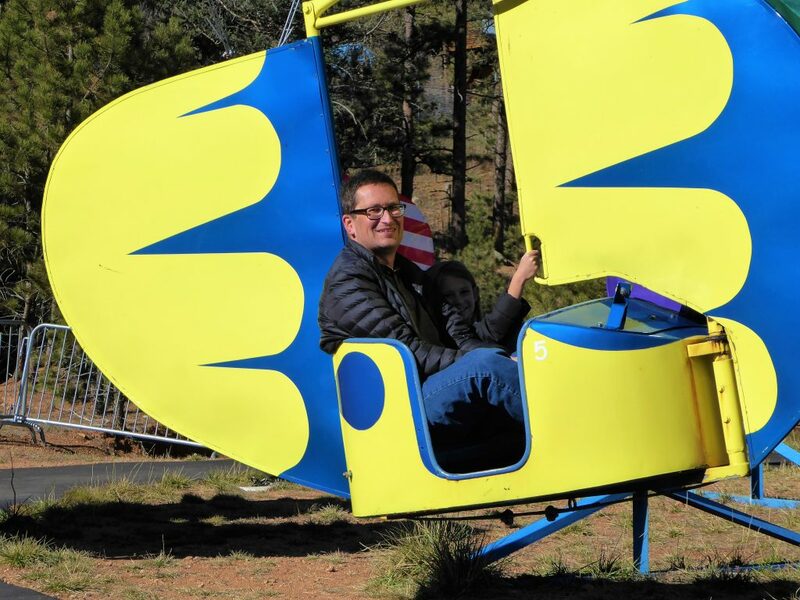 Most rides require only an adult chaperone. Additionally, there are some rides for younger kids only, which was disappointing to this kid at heart. 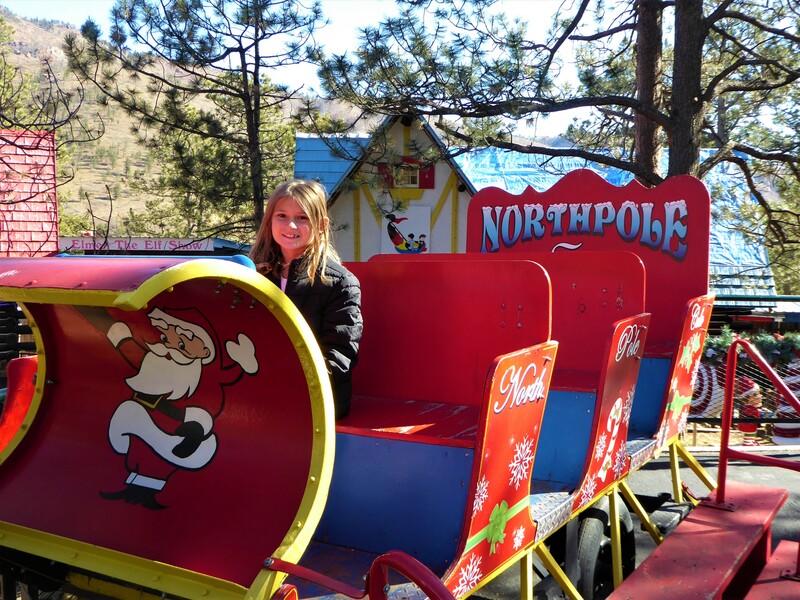 Trust me, I tried to get on these rides, but the elves at Santa’s Workshop claimed I was too tall to ride. There are more than 25 rides at the park. Most are gentle rides, although there are a couple which appeal to the more adventurous soul. 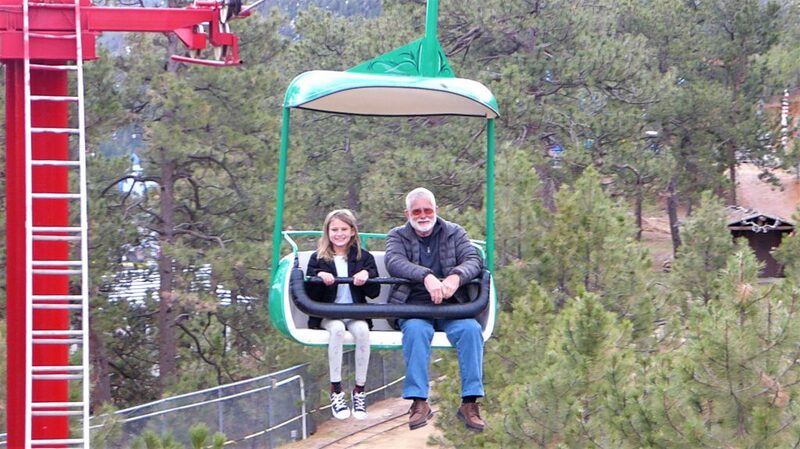 The newest ride (and our family favorite) is the zip line adventure Santa’s Sleigh Ride. Buckled in to Santa’s Sleigh, you are catapulted backwards several hundred feet on the zip line before zooming forward. The ride provides amazing views of the region. Music plays in the sleigh while you are riding, which was fun. The Candy Cane Coaster is your standard park roller coaster ride with enough bumps and jolts to make you wonder if you have whiplash. Our kids really enjoyed the Paratrooper ride which swings you quickly through the sky. The Dive Bomber Ride is a similar speedy ride, but you control your plane. You also control your height on the Christmas Tree Ride. We loved the gut drops on the Space Shuttle, and the kids enjoyed riding the Mini-Himalaya with it’s zippy forward, and backward spinning. Our whole family enjoyed the relaxing Sky Ride, which was a peaceful ride in a overhead ski lift-style gondola. We also had to ride the carousel, because, well, because you always have to ride a carousel. However, the most enjoyable ride at the park was the most simple. I enjoyed grabbing a potato sack, climbing up a narrow staircase, and sliding down the Peppermint Slide. No state of the art mechanics was needed to relive a small piece of my childhood on the slide. The simple Peppermint Slide is loads of sweet fun. There are a number of food vendors. The family-friendly menu options include burgers, dogs, nachos, and chili. Food is reasonably priced, making it inexpensive to feed a family. You also may carry a picnic lunch into the park. There are several outside eating areas and picnic tables throughout the park. 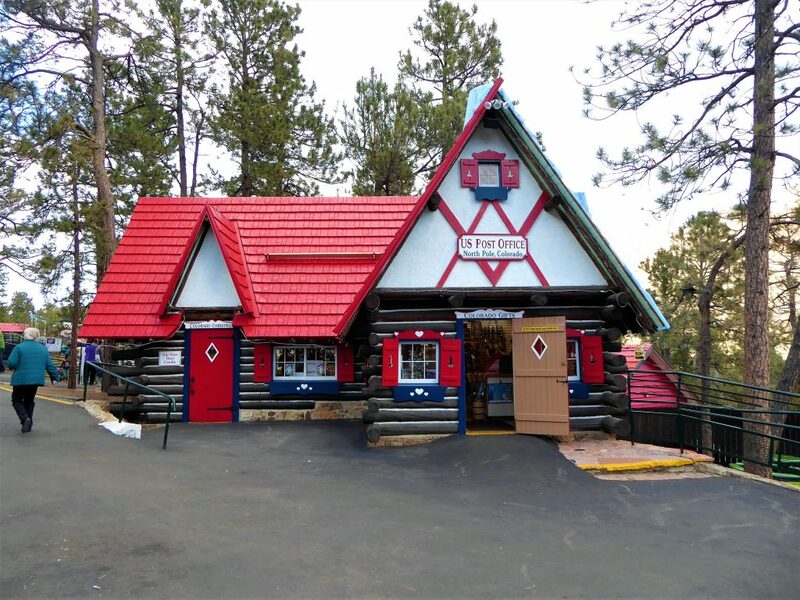 Since it can get cold at the base of Pikes Peak, the elves at the North Pole placed outdoor patio heaters around the picnic areas for you. No trip to Santa’s Workshop would be complete without a looksy at some of Santa’s reindeer. The North Pole has a number of English Fallow Deer and alpacas. For $1, you can get a generous cup of kibble for the animals to eat. Our daughter’s cup of food lasted for a long time. Either she was stingy or the cup was bountiful. 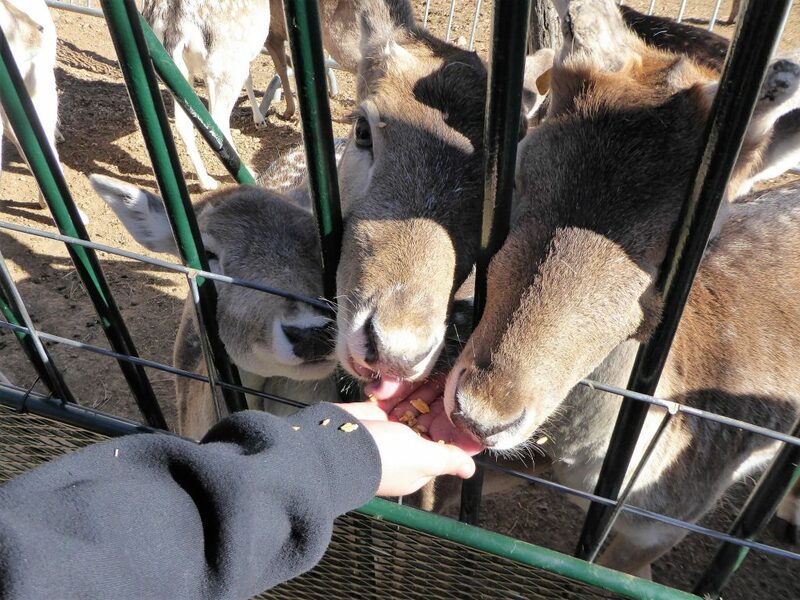 We feed some of the English Fallow Deer. After a visit to Santa’s House, this was the second most important stop on our tour. The kids wanted to see and feed the animals before they got on any rides. A number of stores and shops are scattered throughout the park. One of our favorite shops is the glass blower’s shop. Here, you can admire and purchase glass ornaments or watch the glass blower honing his craft. While in his shop, the glass blower told us his story. He started working at Santa’s Workshop in the summer of 1969, and enjoyed it so much that he never left. It was fun for our family to see the craftsmanship of his work. It’s rare to watch someone with such skill actually hand-craft his work. In a day of mass produced, machine-created merchandise, this was a refreshing stop. 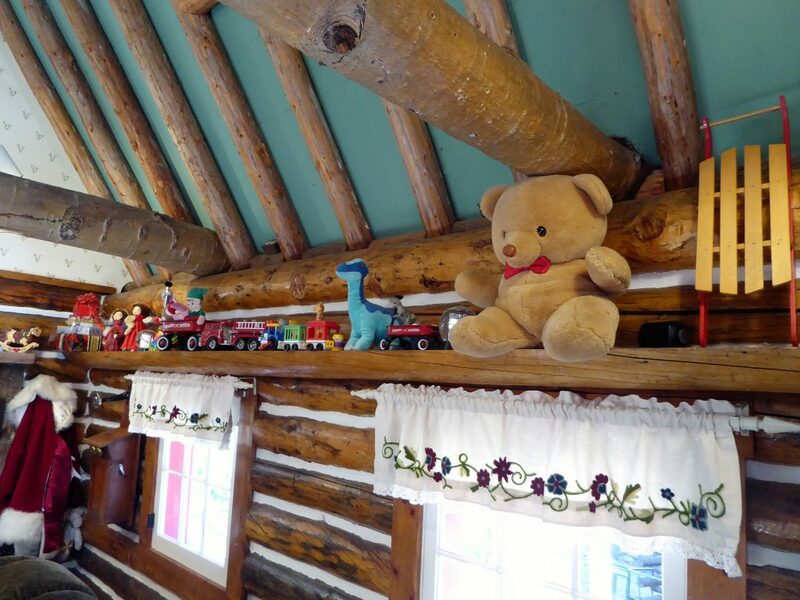 The Colorado Store, inside the North Pole Post Office, has memorabilia with a distinct Rocky Mountain flair. 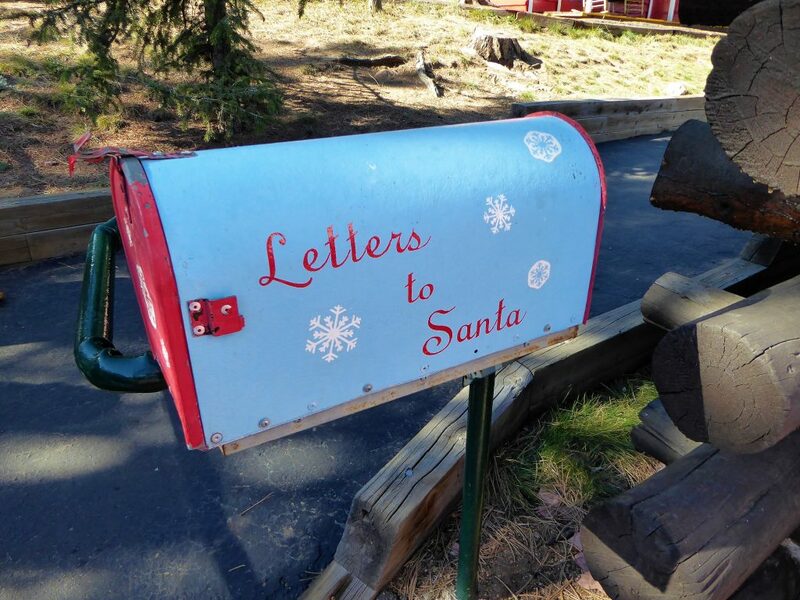 At the post office, you also can mail off letters and Christmas cards with a North Pole, Colorado postmark. Other stores include the souvenir shop, the gift shops at the park’s entrance, the Christmas Shop (with ornaments and stockings galore), the Toy Shop, the Candy Shop (with freshly made treats), and the Personalization Shop where you can engrave your special gift. We were impressed with the reasonable prices at all the shops. Too often, amusement parks and tourists spots charge an exorbitant amount for souvenirs. However, this is not the case at Santa’s Workshop at the North Pole. What would the North Pole be without some holiday decoration? Fortunately, there is a ton of fun decor throughout the park. Like the rest of the park, the decor has an old-time feel to it. 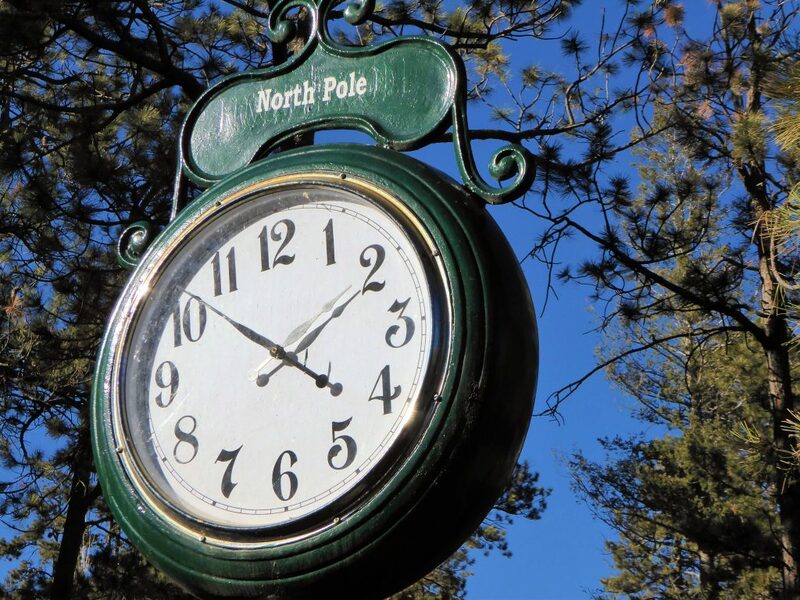 One of the most visited spots within the park is the North Pole post. Everyone stops to touch the frozen post to get an idea of what the North Pole actually feels like. Of course it’s cold, but it’s also a great spot to get a picture of your kids touching the icy post (or sticking their tongues to the post). The Christmas Village provides a great opportunity to stroll through a Nordic-inspired village. The buildings have that European, old-world flair with pitched roofs and vibrant primary colors. We admired all of the window shutters in the buildings. Each building had a different shutter design, with Christmas-inspired carvings in the shutters. 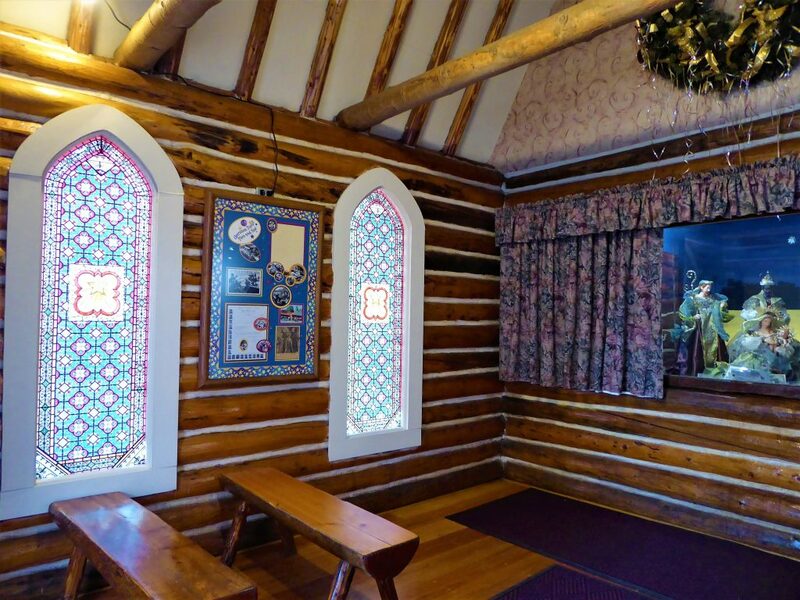 The chapel is a quaint (and quiet) place to stop and consider the more religious aspects of the Christmas holiday. 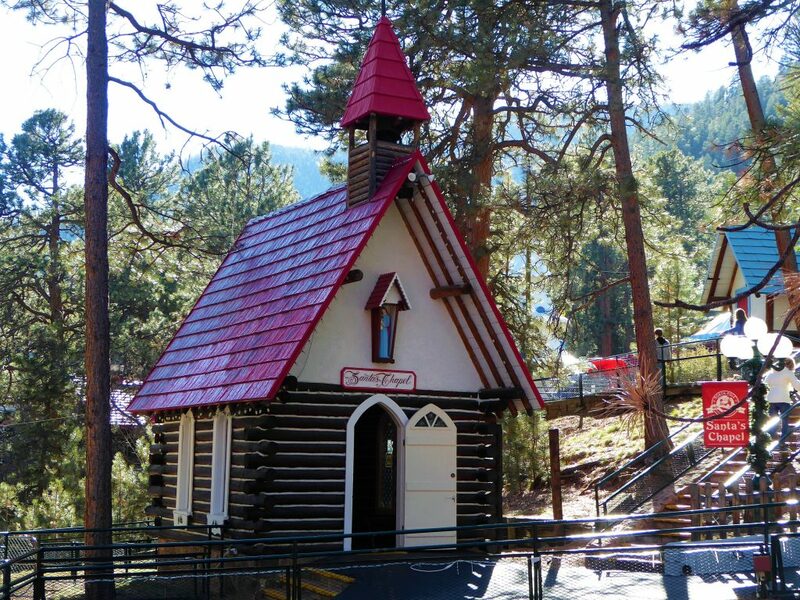 The stained glass windows, wooden pew, high-beam steeple, and ceramic nativity scene provided a pleasant respite from the wild rides throughout the park. Also, kids love to ring the church bells within the chapel. A fire pit is centrally located within the village. You can purchase a bag of marshmallows from the Candy Shop and roast them over the fire pit at the Christmas Village. Or, simply sit by the fire and warm your body on a cold day. We all know that you can see Santa many places during the Christmas holiday season. However, we like visiting Santa’s Workshop in Colorado to see the real Santa Claus. You find the Big Man at his house, near the entrance to the park. As you can imagine, his magically decorated house is the central draw at the North Pole. We visited the North Pole two times. Our first visit was after Thanksgiving a few years ago, and the line to sit on Santa’s lap was about 45-minutes to one hour long. However our wait time was five-minutes during our second visit during the first week in November. The lesson: timing matters. Expect longer lines the closer it gets to Christmas. We appreciate the personal attention we get at Santa’s House. The line can get long. But, the elves monitor the entrance and allow only two families into the house at a time. This makes the visit with Santa special. You can take your time and really have a personal one-on-one conversation with the Big Guy. One of Santa’s elves will take a professional picture during your visit, but you also are free to take your own photos while your kids (or parents) are sitting on Santa’s knee. You may, of course, order the professional photo. You can also have the photo embossed on a mug or Christmas tree decoration (which is what we did). 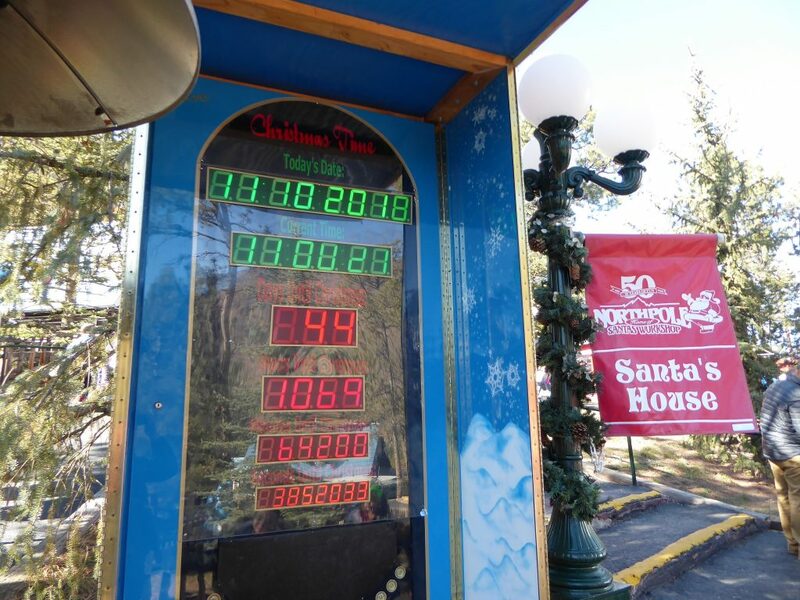 If you are spending money on admission tickets, you want to know if you get your money’s worth at Santa’s Village. We think a visit is worth the money spent, especially if you younger children dream of meeting Santa Claus. There are enough rides to make a days-long trip at the park, although a family with younger children may consider a shorter stay at the park. Our family spent a full day at the park, and there were still plenty of rides to ride. While the park is showing signs of age with the older rides and buildings, the older feel has a definite appeal. Season passes can be purchased, but we think that a once-a-year visit would be enough for most families. Our kids enjoyed the rides throughout the park, and there was enough variety to keep us engaged throughout the day. Finally, the food and merchandise prices are reasonable, so we didn’t feel fleeced in either category. Our family has an out-of-this-world time at the Space Foundation Discovery Center in Colorado Springs. The U.S. Olympic Training Center is a short drive from Santa’s Workshop in nearby Colorado Springs. 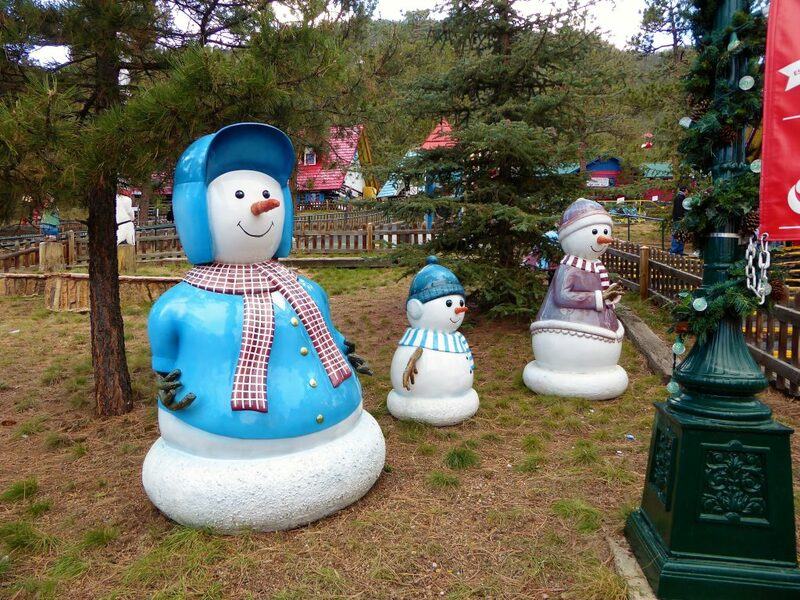 Want to continue the family fun after the North Pole closes? Spend a night at Great Wolf Lodge, Colorado Springs. This looks magical! I love old parks like this. There is a North Pole in New York too! OMG I love Santa’s Workshop. My family used to go there as a kid and it was always so much fun. I knew Christmas was coming when we would pack the wood panel station wagon up and head down from suburban Denver to go see Santa. I never asked why we were driving south to get to the North Pole but it didn’t matter. It was the magic of Christmas and innocence of childhood wrapped up in one. What a fun memory. So happy we could help you relive a little of your childhood. As a kid this would have been my dream. It looks just like I imagine santas workshop to be. 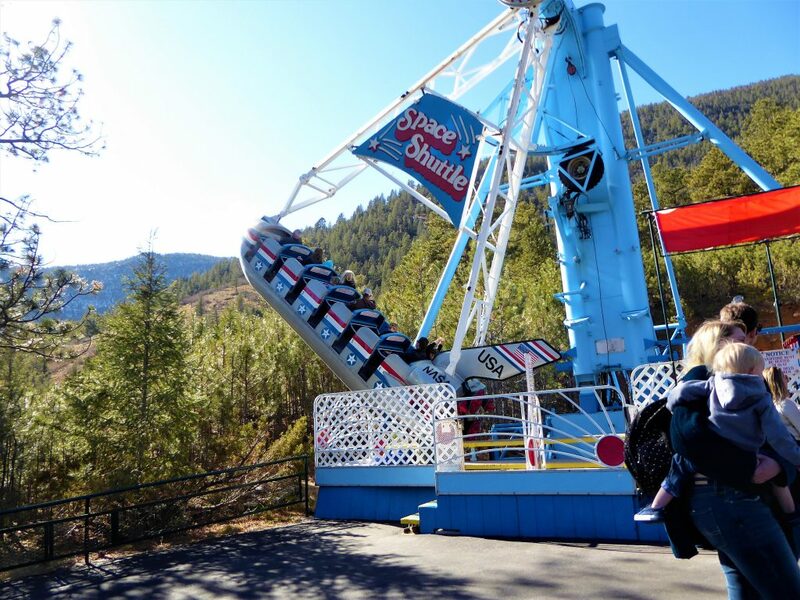 The rides look like they would keep you occupied for a while and your children look so happy! We were very entertained for a full day. It does look like Santa’s workshop should look. Well, I had no idea there was a North Pole, Colorado! Pretty cool! And 25 rides is definitely enough to make a $24 entry fee totally worth it! I think I would love the zipline (total zip fanatic) the most along with the chapel second. Awesome park! We enjoyed the zip line, especially since we were sitting down comfortably in Santa’s sleigh. Yes, admission is a great deal when you see all the North Pole has to offer. That zip line looks like a lot of fun – and friendly enough for younger riders, too. I also like the design of the cottages, they really give the feel of being somewhere else, and somewhere a little more magical. I love watching glass blowing artists at work, it’s absolutely amazing what they can do! 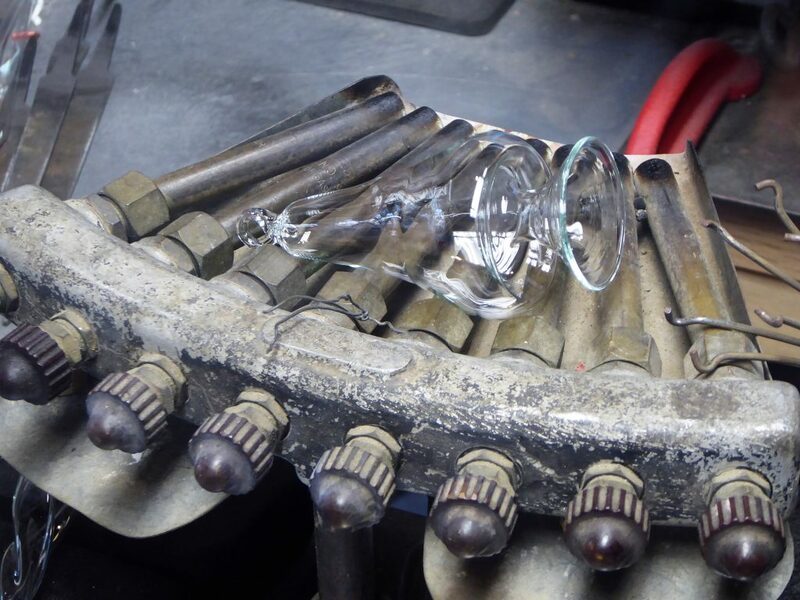 Yes, glass blowing is an amazing art form. Michael, we are firmly convinced that the North Pole is wherever Santa is. He is magical. Aww, I would also have been disappointed if I was not allowed on the ride. Being a child at heart should count! Santa’s Chapel look so pretty! The stained glass windows are so gorgeous! I love watching glass blowers at work. It’s such an amazing experience to watch. This place is awesome! I had never heard of it before and the more I read, the more awesome it was. 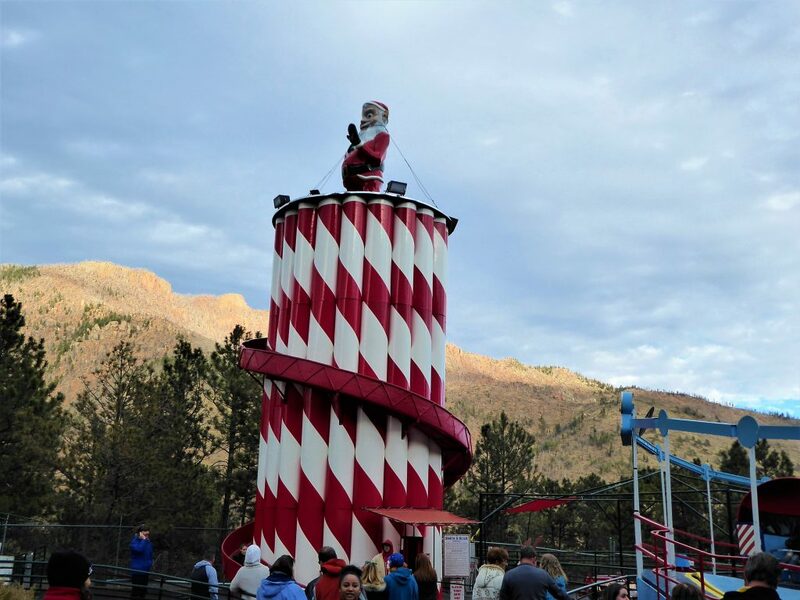 My kids would LOVE the zipline and the candy cane slide looks like so much fun. 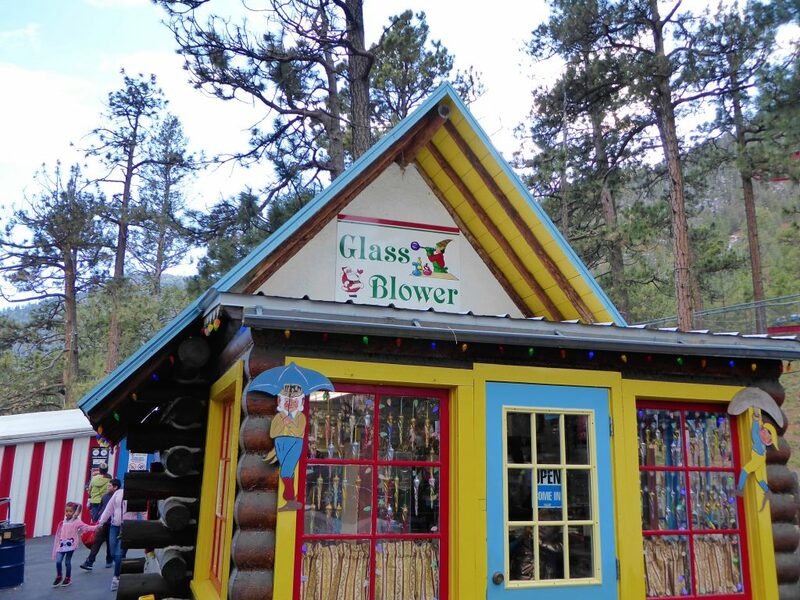 I’d love to visit the glass blower as well. It must be even more amazing when its covered in snow. We missed out on the snow, but I’m sure it is magical when snow covers the ground. Thanks for sending the link. We are hoping that our kids have fond memories of the North Pole once they grow older as well. What a fun place to visit! My family is obsessed with Christmas so this would be a perfect place for us to visit. I’ve seen the North Pole in a few other states but did not know Colorado had one. Thanks for sharing. Thank you. We are a little obsessed with Christmas too. What a fun place to take the kids, and even the adults who want to feel like kids themselves again. They have so many activities to keep everyone entertained and get you into the Christmas spirit. Yes, there is plenty of variety and plenty to do. Santa’s Workshop North Pole is such an adorable place for children and families. Love the decor and the ability to meet Santa Claus. I love reading how Christmas is celebrated in different parts of the world. It looks like you had a total blast!